Want to start a Portland radio station featuring left-leaning talk shows all day, but need $10,000. Not to worry. Say your station will be an “arts and music” outlet and a taxpayer-funded program of the Regional Arts & Culture Council (RACC) will pick up the tab. RACC, which says its grants “provide artists and arts organizations with financial support,” has an Opportunity Grant Program funded by the City of Portland. It’s designed to provide grants to Portland-based nonprofit arts and cultural organizations to help meet special opportunities or assist organizations with emergencies that arise during the year. Phil Busse, director of the Portland-based Media Institute for Social Change and former managing editor of the Portland Mercury, submitted an Opportunity Grant application to RACC in 2012. The application said Busse wanted $10,000 to facilitate “a locally-focused music and arts-information radio station that will be broadcast throughout Portland starting in January 2013.” There was no mention of any plans for the station to focus on progressive talk shows. According to the grant application, the Institute was partnering with Common Frequency, a California-based nonprofit that provides technical assistance to community-based and low-powered radio stations. When Reed College abandoned its radio station, Common Frequency acquired it. But the license didn’t provide complete coverage of Portland, allowing only for radio coverage east to west from the Willamette to 82nd Ave, and north to south from the Columbia River to the Sellwood neighborhood. The $10,000 would apply towards the purchase an FCC license. “The additional license the RACC grant would fund would allow sufficient coverage on Portland’s west side to truly create a city-wide station,” the Institute’s grant application stated. The RACC Board approved the special Opportunity Grant to the Institute on July 20, 2012. Then the music station was hijacked. In November 2012, Portland’s KPOJ-AM 620, a welcoming home to progressives, shifted to Fox Sports Radio 620. Previously, KPOJ had featured a three-hour morning show with an outspoken progressive host, Carl Wolfson, along with progressive talk shows featuring Thom Hartmann, Randi Rhodes and Mike Malloy. Local progressives responded with fury to KPOJ’s format shift. BlueOregon, a blog describing itself as “the water cooler around which Oregon progressives will gather”, initiated a campaign to collect signatures on a petition aimed at saving progressive talk radio on KPOJ. But KPOJ and its owner, Clear Channel, didn’t yield. So XRAY.FM, the new music and arts-information station championed by Busse, will, instead, feature progressive talk during the day when it goes on the air in January if all goes as planned. 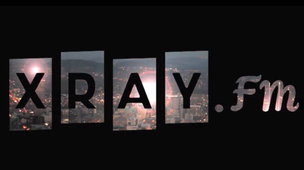 “I can already see the town dancing to the beat of XRAY.FM,” Jeff Hylton Simmons, an early advocate of the station, said in an Awesome Foundation online posting. XRAY.FM will embrace the “mullet model”, as the station’s Facebook page puts it, “business in the front, party in the back.” Programs will focus on progressive talk during the day and relegate music to the night. Talk show hosts on the station will include Carl Wolfson and Thom Hartmann, both well-known progressives. Jefferson Smith, co-founder of the Oregon Bus Project and a onetime Democratic legislator, has also signed on as senior advisor on board development and community engagement. How about you? Want an Opportunity Grant from RACC for a radio station featuring conservative talk shows? Sorry. The Opportunity Grants were a victim of Portland’s 2013-2014 budget cuts. Washington County or Casino County? You know the typical casino ad. The gorgeous blonde’s crystal blue eyes gaze adoringly at the urbane, fashionably dressed man as he places a bet. The couple is surrounded by smiling, equally fashionable friends enjoying the gaiety. You almost expect Jay Gatsby to stroll into the scene from West Egg and enjoy the fun. Dede’s Café, hiding off to the side in the Hillsboro Promenade at the corner of Southwest Baseline Road and Southwest Cornelius Pass Road in Hillsboro, is the raw reality of the casino Washington County has become. At Dede’s, six video lottery machines with brightly lit screens are crammed into a space not much more expansive than a large walk-in closet. On a recent mid-afternoon visit, I found all the machines being used by solitary, slightly disheveled men and women in jeans and sweatshirts. All of them looked hypnotized by the glow of the screen in front of them. Almost motionless, except for the rapid movement of their hands to push the play buttons, they sat mute in the dim light. A man with a black hat pulled down over his gray hair slipped a $10 bill in one machine and started briskly tapping the play buttons. He got up to $46.45 on Game of Dragons II, but didn’t take his winnings and celebrate. Instead, in a few minutes he fell back to $5.19. Switching to a Zeus game, he bounced up to $23.49. When he went to $6, he shifted to another game. After 20 minutes of play, when he was down to 35 cents, he slipped in another $20 bill and resumed play. Oregon voters overwhelmingly approved the lottery in 1984. It launched in 1985 at a Portland event featuring an 84-foot-tall inflatable King Kong, perhaps symbolizing the behemoth the lottery would become. 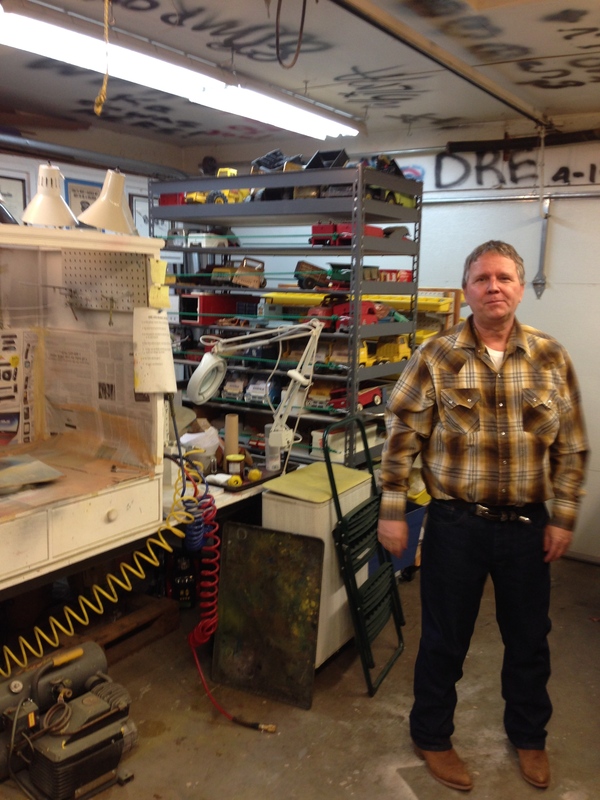 Dede’s Café is now part of a rising river of lottery money flooding Oregon. The money has turned the county and the state into unwitting addicts as Oregon’s lottery take has gone from $87.8 million in 1986 to $1.1 billion in 2013. It’s a very big business. The lure of raking in lottery dollars without having to raise taxes has long been appealing to politicians anxious to satiate government’s insatiable thirst for revenue. In fact, the lottery is often referred to as a “voluntary tax,” though Schüll’s research calls the “voluntary” part into question. In fiscal year 2013, 204 lottery retailers in Washington County generated net receipts of $87.7 million from 1,035 video terminals, almost equal to the number of video slot machines at the Wildhorse Casino in Pendleton. The numbers are even more impressive when you combine net receipts from video terminals with sales of traditional games, such as scratch-its and Megabucks. Together, these totaled $125.7 million in all of Washington County. Washington County sees a return from all this gambling activity in the form of direct and indirect jobs and money the state devotes to parks, natural resources, education and various economic development efforts. The county also receives direct payments equal to 2.5 percent of lottery proceeds. This money must be applied to economic development/job creation programs, liberating county revenue for other priorities. But the lottery bounty also means the county and state are increasingly relying on the generous flow of lottery dollars, which are not a dependable or sustainable source of revenue. If lottery revenue declines, or even fails to grow, a lot of established programs could face tough adjustments. Washington County residents are getting decidedly mixed messages. On the one hand, business and government leaders are aggressively delivering messages about the importance of education and hard work in achieving success. At the same time, the lottery undermines the messages by constantly suggesting in tantalizing ads and much ballyhooed winner announcements that riches are just one lucky ticket or one play away. So go ahead. Make your wager. Just remember that in the end, the house always wins. Bill MacKenzie is a former congressional staff member, newspaper reporter and communications manager for a Hillsboro company. When WalMart proposed a 210,155 square foot Supercenter with more than 1,000 parking spaces at the intersection of Cornelius Pass and Baseline Road in Hillsboro 10 years ago, the surrounding community went berserk. Fired up opponents had no shortage of complaints. Too much traffic. Too big a building. Too little pay for workers. Not compatible with the neighborhood. WalMart’s anti-union. In the face of vociferous opposition, Hillsboro’s Planning Commission denied WalMart’s proposal. Now, as the little girl Carol Anne said in the 1986 trailer for “Poltergeist II,” “They’re baaack!” And the critics are, too. At a Nov. 13 public hearing held by the Hillsboro Planning Commission, WalMart representatives tried to set a new tone for a newly designed project called Sequoia Village. “That denial decision has shaped what you have before you tonight.” said Greg Hathaway, an Oregon attorney for WalMart, when introducing the new design. Instead of a regional Supercenter of Brobdingnagian proportions, there would be a smaller, more appealing neighborhood grocery store of about 50,000 square feet that would draw mostly local folks, explained a WalMart team representative. There would also be 242 apartment units and two small retail buildings. Instead of 1,000 Supercenter parking spaces covering acres of asphalt, there would be just 284 parking spots adjacent to the grocery store and almost eight acres of open space. An improved road system, already in place, would capably handle traffic. There’d be more tree preservation and trail enhancement. When the commission members asked supporters of the proposed project to come forward and comment, not a single supporter came forward — just one woman who said she was neutral. But when the commissioners asked opponents to come forward in groups of three, a very long night of testimony began. I don’t like this; I don’t like that, asserted one opponent after another as they paraded to tables facing the Planning Commission. WalMart’s a low-wage company. Traffic will be horrific. Our neighborhood will be destroyed. The development will mean more kids and that will hurt our schools. The new site plan doesn’t have a Northwest feel. Wildlife will be harmed. It will hurt the Albertsons store across the street. It will draw poor people. The litany of complaints went on and on into the night (and many were repeated in a Nov. 22 Hillsboro Tribune editorial). I suspect what’s really driving the opposition is an anti-WalMart mindset, fostered by unions and some progressive groups, and a fear of growth. To the generic anti-WalMart folks, the answer is simple. If you don’t like WalMart, don’t shop or work at their stores and let the marketplace function. If not enough people want to work or shop there, it will not succeed. Consider also that WalMart can mean good things. As Jason Furman, chair of the Council of Economic Advisors underPresident Obama, has written, “By acting in the interests of its shareholders, WalMart has innovated and expanded competition, resulting in huge benefits for the American middle class and even proportionately larger benefits for moderate-income Americans … to the degree the anti-WalMart campaign slows or halts the spread of WalMart to new areas, it will lead to higher prices that disproportionately harm lower-income families.”As for the anti-growth argument, stopping this project won’t stop growth. The 26 acres on which Sequoia Village would sit is prime property. It won’t sit vacant interminably. It will be developed. If it’s done responsibly, that can be a good thing, and the Sequoia Village design is a good start. Economic growth is a desirable social goal, and preferable to stagnation. It is economic growth that creates jobs, which leads to more tax receipts, which allows government to pay for public services. While some improvements at Sequoia Village are certainly merited, WalMart’s new proposal is clearly superior to its 2003 plan, and the Planning Commission should move forward to make it work. That doesn’t mean the commission should just accept WalMart’s latest Sequoia Village proposal carte blanche. A more architecturally appealing grocery store is certainly achievable, for example. But a not-in-my-backyard halt to the project just doesn’t make sense. It all started, as so many good things do, with his father. John Venheim’s father, Georg, a decorated veteran of World War II, came to the United States from Norway in 1945 to marry his 17-year-old sweetheart from New York. When Venheim was in kindergarten, his father brought home a 1955 Tonka Metro van he’d bought at Goodwill. Venheim was hooked. In 2010, the year his father passed away, Venheim bought his first Tonka tractor-trailer set on Craigslist, followed by the purchase of several collections of Tonka parts from which he crafted some trucks. When he sold an orange 1958 Tonka flatbed truck carrying a bulldozer for $300, he knew his hobby had taken a turn. “I realized I had to get organized,” he said, “so I put together a complete shop in my garage in 2011.” The cluttered 480-square-foot garage is now packed with a raft of tin toy truck-making equipment, including a sandblaster, woodworking tools, a painting cube, a Thumler’s Tumbler machine that shines chromed parts in vibrating corn cob grit, a metal polisher and a wood jig used to make identical wooden stakes for a Tonka Farm Stake truck. In a corner of the garage are 7-foot-tall wooden racks with shelving. One rack contains already painted projects, another a collection of parts, a third a jumble of supplies. A fourth rack is used to dry newly painted projects at a constant 80 degrees. In another corner is a large metal rack filled with old tin trucks and parts acquired over time. On a shelf is a collection of original, colorful crate labels found on the Internet that he uses to adorn the sides of trucks. “Minton’s. Choice Bartlett Pears packed by C.D. Minton Inc., Forest Grove, Oregon, U.S.A.,” read one. by: JONATHAN HOUSE – John Venheim refurbishes vintage pressed-steel toy trucks that he then sells through his Custom Tin Toy Trucks business. For the past three years, Venheim has been busily building, repairing, buying and selling tin toy trucks and parts made not just by Tonka, but also by Buddy L. Wyandotte, Nylint, Structo and others. 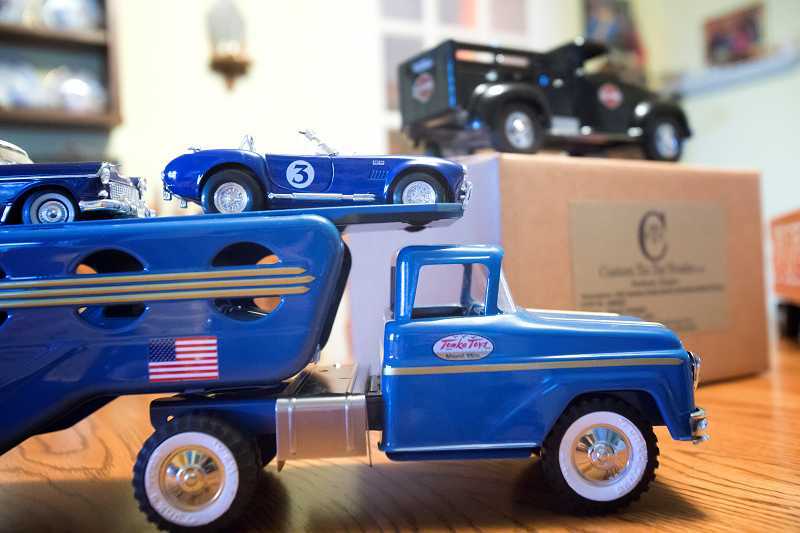 He said he spends about 10 hours a week in the garage immersed in his hobby, but with his non-stop enthusiasm, it’s probably much more as he builds his business, Custom Tin Toy Trucks. He buys and sells on eBay and Craigslist and on specialized websites such as tonkapartsandsupply.com. Venheim also seeks out deals at garage sales. “Lots of people with tin toy trucks have no idea what they have,” he said. 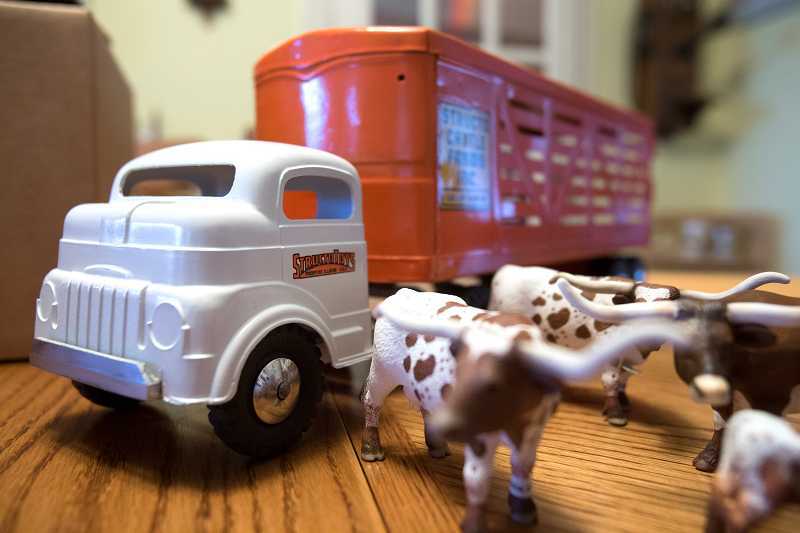 At a garage sale he encountered a woman selling a 1955 tin toy truck for $10. He told her the truck was worth much more and bought it for $80. After he fixed up and polished the truck, he sold it for $127. Some online sellers buy old model trucks online, strip them down and sell all the parts individually. “Most people selling these old trucks don’t realize that if they took them apart and sold the parts, they could get three times as much,” he said. The truck Venheim got the most for was a worn vintage unrestored Steelcraft Streamlined City Trucking Co. truck. What made it special is that it was designed by Viktor Schreckengost, a legendary American industrial designer often called “the American DaVinci.” Venheim sold the truck on eBay for $600. by: JONATHAN HOUSE – Once finished, John Venheims custom tin trucks bring back the nostalgia of these old toys. Some people only want to buy completely original vintage trucks, which tend to cost more. An original 1958 Big Mike dump truck with snow plow and dual hydraulic in mint condition with its original box can go for $1,000 or more. Other collectors are fine with new toy trucks. For them, there are companies like Smith-Miller Inc. of Lake Havasu City, Ari., which sells handmade scale trucks in miniature. A 41.5-inch-long, 21-pound Navajo Freight Lines Hauler is for sale on its website at $1,295. Venheim’s trucks cost considerably less. That’s partly because he hasn’t built a solid reputation yet. It’s also because his creations often have added parts or parts that are different from the original. Once in a while, he even does whimsical add-ons such as a tiny spotted owl he placed on a logging truck. Computer data centers built in Hillsboro’s Enterprise Zone are enjoying generous tax breaks with almost no public accountability. Companies with data centers already open or on their way include T5 Data Centers, Umpqua Holding Cos., Via West Inc., Fortune Data Centers, Digital Realty Trust Inc., which houses NetApp in its building, and Adobe Systems Inc.
Oregon’s 63 Enterprise Zones are designed to attract investments by exempting businesses from 100 percent of local property taxes on new investments for up to two years while construction is in process and up to five years after that if they are growing employment in the zone. Because IT equipment in a data center must usually be refreshed within 5 years, the net effect is that there is no tax, neither sales nor property, on such equipment in Enterprise Zones. Fortune says these “…are enormous financial incentives”. Are the tax breaks Hillsboro’s giving out to data centers paying off for the city? Since the Enterprise Zone program is ballyhooed as a job creator, you’d expect stringent and substantial hiring requirements to be tied to the valuable property tax exemptions. You’d also expect the city and the data center companies getting the tax breaks would gleefully share their job creation achievements with the public to demonstrate their impact, openness and corporate responsibility. Enterprise Zone contracts require that if a data center already operates inside the Zone and applies for benefits or renewal, it is required to increase employment by just ten percent. If a firm locates a new data center in the Zone it only needs to add one employee to be in compliance. That’s right, just one. As for job creation, the City of Hillsboro said it didn’t have employment numbers on the data centers in the Enterprise Zone. Mark Clemons, Hillsboro’s Economic Development Director, has, however, said publicly that all the Enterprise Zone companies have added a total of 1,420 jobs since joining the program. How he arrived at that number without knowing the number of employees at each company, including the data centers, is a puzzlement. Just one data center company disclosed its Hillsboro employment numbers to me. NetApp said it has 12 full time employees plus one contractor and expects to hire one or two more people over the next couple years. It’s likely that the other data centers have similarly small workforces. As a general rule, if incentives cost more than the resulting jobs contribute to the economy, they are misplaced. Given the significant tax abatements enjoyed by the data centers in Hillsboro’s Enterprise Zone, the wisdom of those abatements is questionable. Still, the public can be assured that the employees earn good wages, right? When I asked all the data centers for the average wage of their employees, not a single one provided the figure. But, thankfully, Hillsboro taxpayers can easily find out the value of the tax abatement each of the multi-million dollar data centers is getting from the city. That way the public can judge whether the foregone taxes are worth it in terms of investments made and jobs created. I asked the Washington County tax assessor’s office how much the Enterprise Zone property tax exemptions save each data center annually. “…it has been determined that this information is confidential and exempt from disclosure,” replied Julie McCloud with the Washington County Administrative Office. Quite simply, there is little transparency to the entire data center process. Without a requirement that data centers make their the employment numbers, average wages, investment numbers and the value of the tax abatements public, it is impossible to judge how much each new job is costing the city and whether the job gains are worth the tax losses. Without that, the public can’t know whether the data center Enterprise Zone deals being cut by the city make sense. It’s time to change that.